It isn’t uncommon that after I leave a deeply affecting, emotional roller-coaster of a film that I am left speechless. Contrary to its title, the effects that Short Term 12 leaves you with are anything but short term. In what has become one of the most personal films of 2013, has also been one of my most challenging reviews to write. Ironically enough, Short Term 12 is also one of the most rewarding and mandatory films of the year. Thankfully, there is just too much to share about writer/director Destin Daniel Cretton film that can’t be left unsaid. The film tenderly explores the lives of tormented souls who have faced and are forced to conquer the lasting repercussions of sexual and other violent abuse. For that, Short Term 12 is a weary yet rewarding film that refuses to beg for empathy. Instead it chooses to be a galvanic and delicate narrative intent on telling a story right. More below! The beauty of Short Term 12 lies in its profusely believable dialogue and story-telling techniques. Whether it be sharing intimate details of the lives of the foster-cares ‘at risk youth’; lyrically, poetically or prosaically, writer/director Destin Daniel Cretton creates a film which the characters render the deepest and darkest corners of your heart, while never being melodramatic. Cretton has already explored this world in his Jury Prize winner short in 2009 at Sundance, and whatever politics surround the film as to why his newest feature which expands the world of his short was not included in the Sundance line-up this year, has yet to be explored. Unfortunately for Sundance, this is one feature film that compliments some of its illustrious winners, specifically my top film of 2013 Fruitvale Station, in admirable fashion. The real heart and soul of the film is Brie Larson who plays Grace, supervisor to the fragile youth inhabiting short term 12. The facility itself, a voluntary juvenile centre in California, is a home that throughout the film, creates constant wonder, sharing in the joys and pains of its guests. Acting as teacher, big sister and disciplinarian to the youth, Grace along with her secret lover and boyfriend Mason (The Newsroom‘s John Gallagher Jr.) are a tag-team duo. Together they create a healthy and safe environment where the youth are forced to lead lives that include healthy ways of communication and a healthy outlet for anger, fear and other very overpowering emotions. When we first meet Grace and Mason, who have tried to keep their relationship a secret to everyone at the centre, life is anything but perfect. Sharing an awkward and impulsively aggressive love-life, we realize that, like with so many ‘inspiration-teacher genre’ films, the teachers have just as many problems as their students. Deep-rooted in physical and sexual abuse, the two protagonists go on serving as uncompromising examples to the youth in the facility. It is with the arrival of Jayden (Kaitlyn Dever) that Grace’s world is shaken to its core. Sheltered in her headphones wielded with angst-worthy music, Grace begins to connect with Jayden through drawing portraits and telling stories. As Jayden faces the deep secrets of her life and the dark corners of her past, Grace begins to do the same upon the news of her father’s upcoming parole. Questioning her role as a partner to Mason and expecting mother, Grace is unhinged and begins a decent into a path of self-destruction. Each character in Short Term 12 gracefully begins to take similar faces to people in our own lives. The performances in the film, lead or supporting, are familiar reminders of uplifting success stories or tragic shadows of old loved-ones. 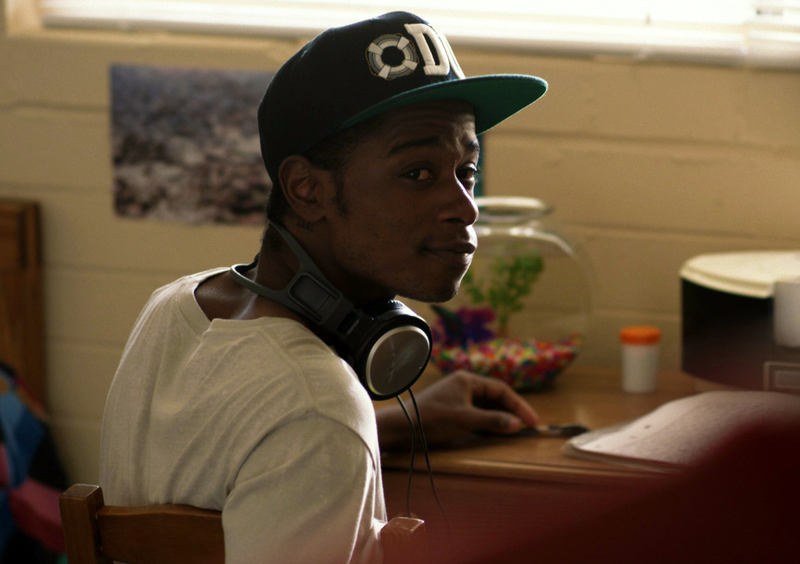 Stand-out performances include that of the eldest short term patron, Marcus (the outstanding Keith Stanfield) who upon approaching his eighteenth birthday is forced to leave short term 12. Marcus along with Mason share some of the most compelling, witty, and powerful scenes together involving nothing less than a bongo-drum or hair-clippers. One of the issues that could have easily plagued the film was its overwrought subject matter and its ability to be preachy. Cretton, who admitted to having a position similar to his protagonists in his youth, instead opts for a very unnoticed “fly on the wall” filming approach that allows the film to explore the many hypocrisies that fill the ‘inspiration-teacher genre’ uninterrupted. Cretton creates deep characters with meaningful roles that share the same issues as their patients. Never lumpy, the overall commentary on listening to your own advice, institutionalized help and the role of care-givers juxtaposed directly against those of therapists and psychologists is revealing yet unwaveringly passionate. The authenticity of Short Term 12 as a whole is quite refreshing. Cretton, who exchanges the glamorous for the intimate, tells us a real story of ordinary people with real problems, never down-playing the impact of each trauma, no matter how small or how big. Throughout Grace’s journey of healing, Cretton shows how life is filled with interchanging teacher/pupil roles and how regardless of age, we learn from one another. Larson is destined to become a force worth reckoning with thanks to her portrayal in Short Term 12. Larson’s heartwarming yet weary depiction of a rehabilitated character really brings home Mason’s description of Grace, where “weird and beauty come together”. Grace’s willingness to abandon all physical beauty as well as her joy to share deep emotional and mental insight to her children is never compromised. Larson is revelatory as a person raising a helpful hand to a small minority of the American population that is generally outcasted and ignored. Never in a million years would I have thought that a film full of monologues, including a monologue about someone shitting their pants, literally and figuratively, would have made it on my list of best films of the year. But much like the film itself, Short Term 12 is an unexpected diamond in the rough. Blending spot-on humor with an uncanny sense of realism, the film succeeds as an exploration into the lives and reasoning of people who are willing to subject themselves to self-inflicted pain. And unlike many festival film entries, where death is sometimes the unnecessary ending of a story, it instead exchanges that formula for life as the beginning of new stories. Short Term 12 is a film that will be on my mind for many years to come. Sadly, the film will go mostly unnoticed, having a quick bout in art-house theaters with a limited release. The film is a pioneer towards people who have a desire to extending a helpful hand. Cretton has tapped into an area of education and institutional aid that, in my honest opinion, should be considered as part of the educational system’s curriculum as well as a must-watch for educators, healers and youth-workers. There is no degree of normal or normality in any one person’s life that can be measured. Short Term 12 forces audience members to explore the grungy part of rehabilitation and forces viewers to get their hands dirty with powerful scenes of unfiltered and intensely concentrated emotions. The result is a connection with characters and perhaps an observation into your own life. Short Term 12 is a small film that exemplifies the power of independent filmmaking. As Mason describes a story of his own as “a story-tellers wet-dream”, the same could be said of Short Term 12. Night Film Reviews: 10 Out of 10 Stars! Equally touched with the power of the film and its performances? Is Short Term 12 one of the best movies of the year? Leave your comments below and share your thoughts. This entry was posted in Reviews and tagged Brie Larson, Destin Daniel Cretton, John Gallagher Jr., Keith Stanfield, Night Film Reviews, Rami Malek, Reviews, Short Term 12. Bookmark the permalink.